Bright sunny days can be tough for the photographer. Usually I’m so up close and not having enough light is my problem, that sunny days are good for my photography. In this case, I wasn’t really shooting macro because of the bigger subject, however, and the sun, well, I did what I could, including some post-processing to tamp down the highlights on the butterfly. 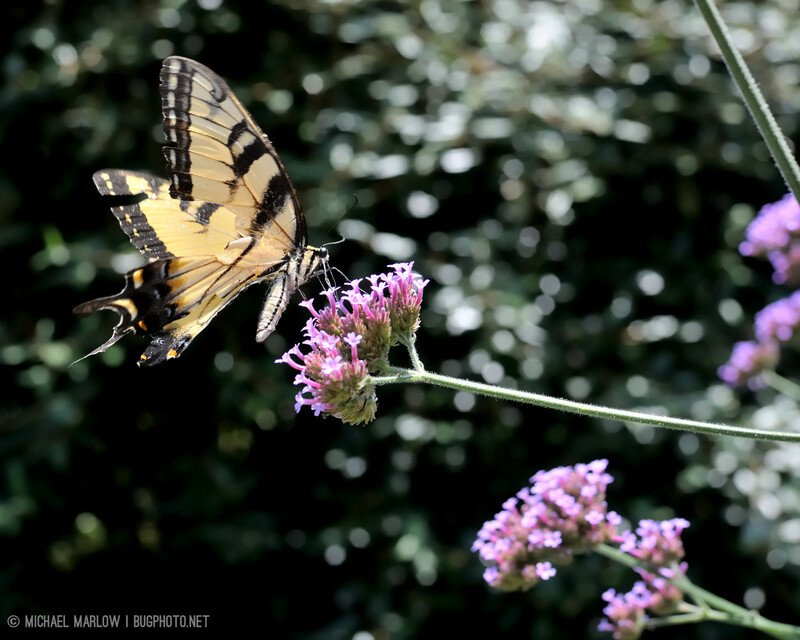 Posted in ButterfliesTagged butterfly, butterfly bush, Macro Photography, macrophotography, Papilio glaucus, tiger swallowtailBookmark the permalink. I’m off to Cyprus to visit the aged parents next week. While there I’ll be macro-togging all that moves. I must confess I often find myself wishing for a cloudy day as I struggle with the bright sun and harsh shadows. Cyprus sounds wonderful right about now, though I’m pretty happy with the way things have picked up. The jumping spiders finally came out a couple days ago, and the day before that I happened by dumb luck to find a magnificent red and black blister beetle. I wish you many interesting finds and good shots. It is sort of a vagary and a perk of my macro set up, but I usually have to get so close to my subject that my camera and diffuser shade the area. Harsh specular highlights can sometimes be a problem, but the bright sun (usually) makes for better backgrounds in my true macro shots.